Two polaroid filters are held together so that the light passes through both. If the filters are held so that they are alined the same way, the effect is the same as it would be for one filter. When we then rotate one filter the light gradually darkens, with 90 degree rotation no light is passed. If we continue to rotate the light increases once more. The diagram below is to explain the general idea of a polaroid filter, not the precise way in which it works! 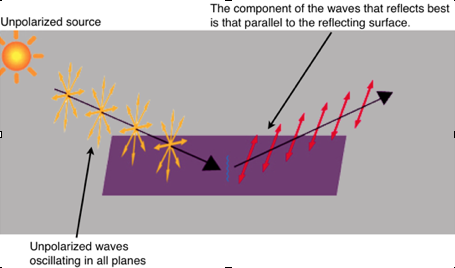 Light entering the first filter is not polarised, the waves oscillate in every plane. 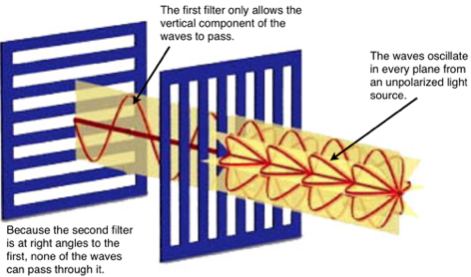 The first filter will only allow waves oscillating in a vertical plane to pass through. If a second filter is then placed at right angles to the first then it will allow no light to pass. Sunlight reflecting from sea, sand or snow is partly polarised. The waves oscillating in a vertical plane absorbed much less than those oscillating horizontally. If a polaroid filter is turned so that most of this directly reflected light is cut out then glare is reduced. A polaroid filter is often used in photography to cut out glare and improve the contrast in a photograph. With a filter the reflection from the surface of the ice is bright and lacks detail. In the second frame the exposure on the rough ground looks much the same but there is more detail on the ice. In the frames below the second image taken using a polaroid filter has more contrast. The diagram below is to explain the general idea of a polaroid filter, not the precise way in which it works! Light entering the first filter is not polarised, the waves oscillate in every plane. The first filter will only allow waves oscillating in a vertical plane to pass through. If a second filter is then placed at right angles to the first then it will allow no light to pass.